It is a special occasion for me to be here with two very good friends of mine: with Elliot Sperling to whom the volume Trails of the Tibetan Tradition we are releasing today, is dedicated, and with Tashi Tsering, the publisher of the book. Being settled here in Dhasa, I have chance to spend time with Tashi. It is rarer to get together with Elliot. Being together with both of them happens only on select occasions. One is today and therefore this is a perfect coronation of two year work during which I edited the volume. But this book is not only a token of friendship. It is an acknowledgement of years of Elliot’s work on a shared path with Tashi in which I had the privilege to participate. Elliot is quite well known to most of you. I just need to say that he excels in Tibetan history, especially Sino-Tibetan relations, and is a prominent thinker on current Tibetan policy. He is a source of inspiration to many Tibetans and his friends. This volume is a homage to his commitment to a tradition that we know it’s too deeply rooted and important to be disappearing under the blows of the Chinese. Tibetan culture is here to stay and when people like Elliot are around, this spells good for its future. Elliot and Tashi are living examples of this commitment. A Tibetan and an Inji equally concerned with the fate of a civilisation that has expressed wonderful literature, a unique way of life, arts and music and, of course, supreme religious elaborations. The complex of this amalgam is what there is need to preserve. No side of this multi-dimensional culture should be neglected. Although there is preponderance in favour of religion and politics, the other aspects of Tibetan culture should be equally preserved and promoted. Tibetan culture means searching for the roots of Tibetan identity, the roots of the many outstanding traditions that make Tibetans the Tibetan people. These traditions are agonizing in front of our eyes due to Chinese systematic destruction of Tibetan values and expressions. No one in the free-thinking world, provided there is free-thinking in the world, should allow this. People may have views different from mine, but I wonder whether the extraordinary treasure of the past that forms Tibetan culture (such as, for instance, ancient history) cannot be pursued among Tibetans and Injis alike with an even deeper scope and engagement. There are outstanding expressions that are an enormous pleasure to read and study in the works of the great Tibetan authors of old, which record extraordinary events and put forward great ideas one should savour and ponder. Tibetan studies are becoming very popular in the Universities of the West. At the last big meeting of the International Association for Tibetan Studies in Ulaan Baator in Summer 2013 there were some 600 presentations. What makes me worry is surely not this growing diffusion, on the contrary this is welcome, for it is a sign of the vibrancy of Tibetan studies, but the fact that Inji academia is progressively adapting Tibetan studies to suit models of western thinking and western style elaborations. Tibetan studies are quickly becoming a container for western ideas with the result that the guidelines of the tradition are often neglected. Tibetan institutions and individuals should be the source of the work of anyone having a serious interest in this. This is why the work my friends kewang Tashi Tsering and professor Sperling are doing for Tibetan culture is admirable. They are custodians of the tradition. Because when Tibet will be free one day, and I don’t have the slightest doubt that this will happen one day, we need to see that it is a Tibet where certain traditions, the most creative, liberal and profound expressions, still exist. There will be reforms in the mainstream of Tibet’s great civilisations of the past to move to the future with ancient and modern perspectives. We all need to preserve these treasures before occupation and arrogance of the conquerors will finish them off, but also ask ourselves to contribute by renouncing whatever has not worked until now in Tibetan society. My plea is that conditions should be created so that Tibetans can pursue interest in the literature, writings, the arts, music and social work within and outside the monastic system while waiting for Tibet to be free again. This book is just a drop in the ocean of Tibetan knowledge and history. Much more needs to be done. This is a task for everyone who feels that it is important for the future generations to keep knowing what means to be Tibetan. I don’t want to pester you any further with paternalistic words. I got the idea of a book for Elliot when I was staying in his beautiful house in the woods at Bloomington with herds of deers coming almost to its interior. Elliot gave me shelter and made me follow the work of some of his PhD students at the Department of Central Eurasian Studies, Indiana University. It took me quite a while to convince myself that the idea was a good one. I thought of Elliot’s embarrassment and I am sure he is pretty embarrassed today to receive the book at this function. But I also thought he deserves it thoroughly. I asked Gedun Rabsal to join me, thinking of the friendship and mutual respect between Elliot and himself. He is his assistant who teaches Tibetan language at the Department, an Amdowa you should know, for he lived in Dhasa for several years and has been a founding member of Bod kyi dus babs. Rabsal asked me to co-opt Nicole Willock in the project. She is a graduated student of Elliot’s and was willing to help in producing a volume for him. I wish to thank them both for their assistance. The volume is published by the Amnye Machen Institute and its online version by Revue d’Études Tibétaines (Review of Tibetan Studies), from Paris. I think this makes a good combination between a Tibetan production and Inji diffusion. 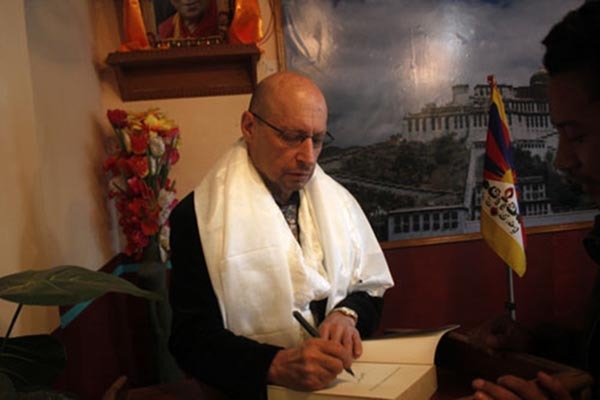 The book benefits from 28 pens, some of the most distinguished scholars in Tibetan studies. They are either Elliot’s close friends, or distinguished colleagues, as well as students who have progressed to become good scholars under his guidance, and colleagues who have participated in exchange programs. This somewhat reflects the state of the art in the studies. Two words more. I have to say a few thank you. Thanks to Tashi for helping me in many ways during the phase of the book production including spending much time on the Tibetan articles. Thanks to my wife Cicci Visconti, who has worked hard in all the phases of the book preparation. Tashi and my wife are the ghost editors of the volume. Thanks to Tashi Gyamtso who valiantly typeset the volume at AMI with great dedication. Thanks to Ashwini Bhatia for no less dedicated help in matters visual. Many thanks especially go to all the authors who have contributed a piece to the volume. Writing a piece implies great knowledge, deep research, and putting energy and time into the exercise. I am taken by their care, good thinking and extraordinary professionality. Thanks to all contributors to the book who are far away. They all are ideally with us today. Here are 600 pages written by your people for you, Elliot, a sign of appreciation of yourself as a human being and respect as a thinker and writer!